The Rail Yards Advisory Board (RYAB) will meet on Tuesday, March 26, 2019 at 8:30 a.m. in the Council Committee Room on the 9th floor of City Hall. RYAB meetings are open to public attendance but do not include public comment. This project focuses on the Rail Yards site in Barelas Neighborhood between the rail road tracks and 2nd street. The Master Plan project began in 2008 with the City Council's creation of the Rail Yards Advisory Board (RYAB) and the City's subsequent issuance of a Request for Proposal to redevelop the historic 27.3-acre site. Samitaur Constructs was selected by the RYAB and Council in 2011, and a series of meetings was initiated in mid-2012 to gather ideas and aspirations for redevelopment of the site from various stakeholders, including the Rail Yards Advisory Board, the Barelas, South Broadway and San Jose Neighborhood Associations, the WHEELS Museum, the New Mexico Steam Locomotive and Railroad Historical Society and the general public. Preliminary concepts for the Master Plan were first presented at a public meeting in Barelas in late 2012 and several additional meetings to further consider these concepts followed. Information and ideas from these discussions were used to inform the Draft Rail Yards Master Development Plan, which was subsequently reviewed and adopted by the City Council and adopted on June 16, 2014. The Rail Yards Master Development Plan provides the policy framework and design standards (see the Barelas Sector Development Plan for zoning regulations) to guide redevelopment of the site and its structures. City Council voted unanimously to adopt the Rail Yards Master Plan in June 2014. You may download the Rail Yards Master Development Plan below. Because of the large size of this file, it has been divided into four sections. September 2018: The City of Albuquerque terminated the Master Development & Disposition Agreement with Samitaur Constructs. July 2018: The Albuquerque Development Commission voted that Samitaur Constructs had not exercised reasonable diligence in the last year. July 2017: The Albuquerque Development Commission voted that Samitaur Constructs had not exercised reasonable diligence in the last year. June 2014: Council approved the Albuquerque Rail Yards Master Development & Disposition Agreement with Samitaur Construct. EC-14-82. *unless noted otherwise, all materials, including images and words, that have been produced by the Master Developer, Samitaur Constructs, are property of Samitaur Constructs, and are intended as reference material for viewing only; this content cannot be printed, published, disseminated or used other than expressly intended without prior written permission from Samitaur Constructs. F/S R-08-47 The legislation that formed the Rail Yards Advisory Board in March 2008. Job Generation. The Project Area was once an economic pillar for the community and must become one again. The Master Plan should accommodate uses which provide the opportunity for the generation of quality, living- and high-wage jobs and programs which will link those jobs with community residents. Housing. Housing availability is an important element of the Master Plan. The Master Plan will provide for the targeted housing (minimum 30 units of Workforce Housing). The Master Plan should also endeavor to provide additional affordable and market rate housing if deemed feasible. The Master Plan should consider and coordinate the housing component with the City’s ongoing efforts to rehabilitate existing housing. The Workforce Housing should seek to preserve the neighborhood heritage and interface with employment and service opportunities. Community. The Master Plan for the Project Area will reflect efforts to be sensitive to and interface with the surrounding neighborhoods, including Barelas, South Broadway and San Jose. Uses in the Master Plan will reflect efforts to complement and support adopted plans for and commercial areas within the surrounding neighborhoods. The Master Plan will reflect efforts to support current and planned economic activity in the Downtown area and, where physically and economically possible, reinforce the City’s transit goals and objectives and integrate with and complement existing and proposed features and attractions in the area (e.g., the Albuquerque Zoo and BioPark, Tingley Beach, Rio Grande State Park, the National Hispanic Cultural Center, the South Broadway Cultural Center, Old Town and its museums, Downtown Albuquerque and its amenities, the Alvarado Transportation Center, the Historic 4th Street Corridor, etc.). Architecture and Historic Preservation. The Master Plan must both preserve and capitalize on the historic value of the architectural and engineering resources at the site. The City and Samitaur share the belief that the site has local, national, and international cultural and historic significance. Art and Culture. The Master Plan will include opportunities for both art and culture, including, but not limited to the WHEELS Museum. Access to public open spaces within the Project Area will be provided. Economic Development. The Master Plan will be designed to achieve economic and business success for the Project Area. Economic Viability. These Guiding Principles are subject to the overarching need for the Master Plan to create a Project Area that is an economically viable endeavor individually and collectively for the City, Samitaur, WHEELS Museum, Workforce Housing, tenant/users, the public and surrounding communities without creating a need for indefinite direct and/or indirect City or Samitaur funding. 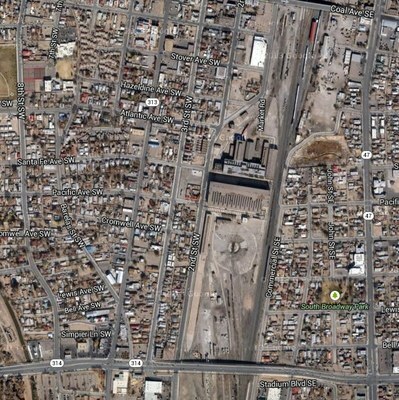 Download a map of the Albuquerque Rail Yards. This site and its significant historic structures, located in the historic Barelas neighborhood and between the rail road tracks and 2nd Street, reflect an important part of Albuquerque's economic and industrial past. The Atlantic and Pacific Railroad established locomotive repair shops and offices at the site in the 1880s and these were modernized and expanded by the Santa Fe Railway from 1912 onwards. The Santa Fe Railway was one of Albuquerque's biggest employers and played a significant role in the development of the city. The shops were in full operation until the 1950s, with the switch from steam engines to diesel engines. After the switch from steam to diesel, the rail yards continued to be used for some repairs and storage. Information for this section came from Chris Wilson, J.B. Jackson Professor of Cultural Landscape Studies and Director of the Historic Preservation and Regionalism Program, both at the School of Architecture and Planning, University of New Mexico. Redevelopment must benefit the adjacent neighborhoods. The ULI panel produced a series of recommendations focused on four areas: market potential, planning and design, development strategies, and implementation. Market Potential- Various uses are possible on the site but the site's master developer will need to find an anchor user, whether it is conventional retail, commercial, or industrial. Planning and Design- No single use or user is likely for the site; therefore, a phased development program is appropriate. Development Strategies- The city should select the master developer and the property should be rendered as appealing as possible by eliminating the hurdles to successful development. Implementation- Pre-development strategies should include appropriate marketing of the site and the creation of an advisory board to oversee the development process. The ULI panel report concluded that several steps should be followed prior to the redevelopment of the Rail Yards. One of these steps was to create an advisory board whose responsibilities would include hiring the writer of the RFP, selecting finalists for the RFP and selecting the master developer. The Rail Yards Advisory Board was formed in March 2008 through Bill no. F/SR-08-47 and amended by R-13-272. The composition of the Rail Yards Advisory Board is intended to reflect the diverse interests and stakeholders associated with the site. The following is a list of the Board members and who they represent.